It was a novelty to be in an RV park with full hook up and wifi. Even though we were planning to go and see the night show at Mt Rushmore, we decided to go in the late afternoon to get a few pictures just in case. When we got up there it was in shade as the clouds had started rolling in and just before dinner we were shown a radar screen of the weather that was on it’s way – thunder and lightening, so we didn’t get to the nightshow. For some reason Lindsay suggested that we book our next stop in Custer State Park which was just as well as we found out it is extremely popular. We couldn’t get three nights in a row, so I decided to do one at a time, securing three different sites in two different campgrounds. Lindsay had been hoping that our front tyres would have lasted a couple more months, but one of our fellow campers pointed out that there was a spot where the metal was showing through. 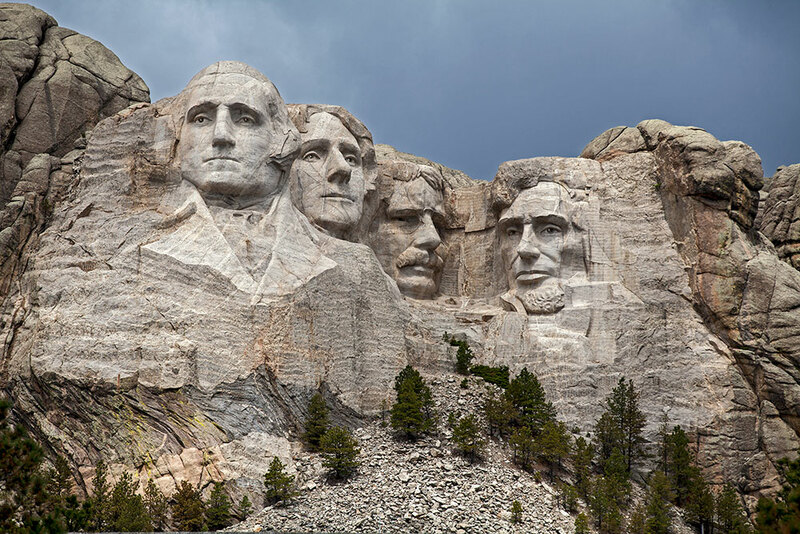 So instead of doing an early morning shoot at Mt Rushmore, Lindsay had to drive back to Rapid City and get four new tyres which took longer than normal as they had to get them from their warehouse. So by the time he got back we had to leave our campsite. I was still hoping we could go back to Mt Rushmore, so we found a spot down a side street in the town of Keystone and dropped off our trailer as the night before the RV entrance to the carpark had been blocked off. Of course that morning, the RV entrance was open, so we could have brought it. I got a few more pictures with the 70-200mm lens this time, it was still overcast and even thought the sun came out a few times, it didn’t light up the President’s faces. The weather that was coming towards us was not promising, so there was no point in waiting. Seeing as we were there, I decided we should go and look at the museum which showed how they it was all done – a major feat in engineering.